January 22nd marks the sad anniversary of the Roe vs. Wade decision that legalized abortion across the United States. More than 50 million unborn children have perished since. 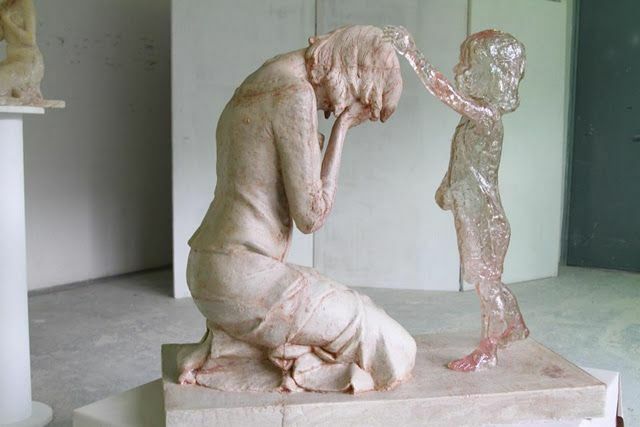 This statue in Slovenia shows a bit of the anguish that many mothers come to know after their abortions. Let us pray that the truth of the value of all life, born and unborn, will be once again championed all over the world. Eternal Father, Source of Life, open our hearts to see and desire the beauty of Your plan for life and love. Fill us with Your Holy Spirit so that our love will be generous and self-giving and we may be blessed with joy. Grant us great trust in Your mercy. Forgive us for not receiving your gift of life and heal us from the effects of the culture of death. Instill in us and in all people a sense of the sacredness of every human life. Inspire our efforts to protect and care for the most vulnerable, especially women who are pregnant and their unborn children, the sick and the elderly. Strengthen us in the hope that with You nothing is impossible. We ask this in the Name of Jesus who by His Cross makes all things new. Amen. This photo is beautiful. It’s expresses how I feel whenever I think about the medication I took when I was pregnant with my son Paul Anthony. Now he is profoundly disabled. He is also the light of my life. Thank you for your meditations. I read them all. MY SIGNATURE ~ “A JOYFUL HEART” IS A LIE, A FRONT. I USE IT TO COVER PAIN, DISAPPOINTMENT, TEARS…. I AM THE LADY ON HER KNEES. I help moms in crisis pregnancies and recently encountered a couple who were planning to abort their child for the same reason. I talked with the dad for quite a while and by the Grace of God they chose life. You can be joyful that you understand the great blessings a child with special needs can bring – being the light of your life; and you can be a light to others about how precious each life is in the sight of God. Place your suffering at the foot of the cross for those, especially on this day, who are considering abortion, that the Holy Spirit will touch their hearts and they will lovingly embrace life as a gift from God. Today, three of my children are at the March in D.C. My husband is at work. I am alone with my loving son, Paul Anthony. He is non-verbal, 45 lbs, and soon to be 22 years of age. I spend many nights awake because he has grand mal seizures between 3 and 7 AM. I carry a huge cross. A cross designed by God’s hands to help me merit heaven. Sometimes, I become overwhelmed at the loneliness because I have no other friends who walk in my shoes who can relate to my situation. So I cry. May the scurge of abortion end soon…. I am sure it is not easy caring for a son with special needs, but as you so beautifully proclaim in your message, the blessings and joy he brings to your family far outweigh the struggles. God’s path for us is not always easy, but He truly gives us the strength we need to carry out His plan for us. Thank you for sharing your message with us and for living the Gospel of Life! Thank you. Being Paul’s mother is sometimes very humbling, because I know he is going straight to heaven, and I may not. I count on his prayers for me when he gets there. May the Holy Virgin keep you safe from all harm as you do all for the sake of Her little children.